Hams are one of Germany’s most favorite meat products, both the air-dried, cured, prosciutto-like “raw ham” (Rohschinken) and the boiled, cured, pink “cooked ham” (Kochschinken). Both types are frequently used as meal ingredients, for example as white asparagus wrap-around or mixed with spätzle noodles. Or ham is used as open sandwich topper during evening bread meals (Abendbrot), along with mustard and fresh tomatoes, pickles or cucumbers. The quality and ultimately the price of hams depend on how long they have been smoked and dried in air. A distinction is then made between Knochenschinken (ham on the bone), Nussschinken (fillet ham), Rollschinken (rolled ham) and Schinkenspeck (bacon), depending on the way in which the ham is cut, spiced, smoked, dried or stored. An important note: the original Black Forest ham is actually a Rohschinken (“raw,” prosciutto-like ham) and not a cooked ham as it is sold in the United States. This ham owes its unmistakable smoky flavor and dark red color framed by a white layer of fat to the fact that the ham is de-boned before it is cured and then smoked over pine wood. This process gained the EU “designated origin” protection, which means, no similar type ham can be called “Black Forest” ham, if it wasn’t produced in the Black Forest area. Dark smoked cooked ham. Ham off the bone, smoked over beechwood chips. Light smoked ham. A real traditional German cooked ham. Smoked over beechwood and very mild. Cured only with sea salt and matured for 10-12 months. This lean, air-dried ham is sold in wafer-thin slices. Very mild. Katen means “barn” in German, indicating that this ham is made farmhouse-style. It is cured, smoked and cooked. Westphalian smoked ham. A gently flavored ham smoked over juniper wood and left to mature for several weeks. As with breads and beers, sausages are main components of German cuisine. You can find close to 1,500 varieties across the regions, a great number of states, cities, or even towns have their own signature ways to mince, mesh and stuff meat, bacon, salt and spices into a casing made from intestines or other materials. Germans differentiate between three types: Kochwurst (cooked – over 350 types) , Brühwurst (scalded – over 800 types) and Rohwurst (raw sausages – 60 types ) prepared in different ways and consumed either cold, sliced, warm or hot. With almost 800 different varieties (60%), scalded sausages are the most common type. Made from raw pork or beef, bacon and finely crushed ice, these ingredients are finely minced and mixed with salt, pepper and other spices, such as coriander, paprika, nutmeg, ginger or cardamom, depending on the type of sausage. 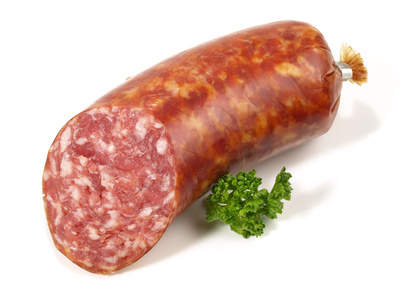 The name “scalded sausage” (Brühwurst) comes from the fact that these sausages are scalded in hot water or steam. They need to be refrigerated and eaten as soon as possible. The most common types of scalded sausage are: Fleischwurst, Bierwurst, Jagdwurst, Bierschinken, Paprikawurst, and Zigeunerwurst (literally, “gypsy sausage”). The most famous of Germany’s sausages are the “Würstchen.” Würstchen can be eaten any time and anywhere; they are filling, taste great and are good not only as a between-meal snack. One could say they are the original convenience food. There’s a huge variety of würstchen – such as “Bockwurst”, “Frankfurter” or “Vienna” sausage, “Nurnberger” or “Thuringian” sausage — and they’re eaten hot or cold, singly or in pairs, grilled or fried. And what would Munich’s annual Oktoberfest be without the world-famous “Weisswurst?” Real Bavarians eat this scalded sausage variety, which contains lots of fresh parsley, before noon, with sweet mustard and fresh pretzels and, of course, a real Bavarian beer. A mildly smoked sausage. Serve sliced or added to pasta, soups and salad. Blood sausage is a sliceable cooked sausage, also known as “Thüringer Rotwurst”, “Grützwurst”, “Zungenwurst” “Speckblutwurst,”or “Flönz” (in the Rhineland). Blood sausages are cooked (Kochwurst) and contain chunks of lean meat, tongue, bacon, lard and offal from pork or beef in varying proportions, as well as rind and fresh blood. Cloves, marjoram, thyme and cinnamon add flavor. “Thuringian Rotwurst” is known to be the “queen of blood sausages, originating in the eastern part of Germany. Other well known examples of this group include “Beutelwurst” (literally: sausage in a bag) from northern Germany and the “Hausmacher Blutwurst” from the Frankfurt area (made according to a traditional family recipe) which is also sold as an air-dried variety. Made from finely minced and spiced pork and beef, then smoked. Possibly the world’s most famous sausage! Made from finely minced pork, then cold smoked. These type of sausages originated in Frankfurt in 1592 to be served at the coronation of King Maximilian. Contain only the best, lean pork. Cooked in vacuum sealed glass to be shelf stable. Lower in sodium than regular hot dogs. Sometimes in the 17th century, a sausage maker from Frankurt emigrated to Vienna and set up shop in the Habsburg empire capital. He know how to make a good frankfurter, but that may not have sold well among the Viennese. So he put the finely chopped sausage met into a crunchy casing and, voila, called it the Wiener. Some century later, another German emigre, Oscar Meyer, successfully marketed the products and the name in the United States. The ultimate German street and barbecue food. Thick and juicy grilling sausages served in warm, crusty rolls. 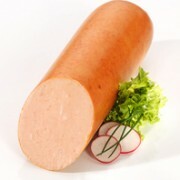 Liverwurst (liver sausage) is available in a whole variety of forms and flavors. However, all varieties must contain at least 10 percent liver – the best varieties contain over 25 percent liver. There is the Kalbsleberwurst (veal liver sausage); Palatinate liver sausage (Pfälzer Hausmacher Leberwurst); “Plunze” – a mixture of liver sausage and blood sausage; “Braunschweiger”; and Pomeranian goose liver sausage with walnut-sized chunks of goose liver. Liver sausages may also be flavored with herbs, anchovies, shallots or tomatoes. 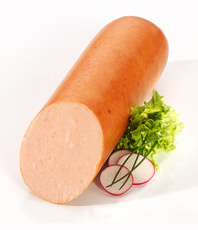 Liverwurst – along with blood sausages – used to be luxury foods that would only be eaten on festive occasions in the past. Teewurst is made from very finely ground pork meat and belongs to the spreadable fresh sausages. Other varieties are called “Pfeffersäckchen” (literally: little pepper sacks), minced ham sausage and onion-flavored minced pork sausage. 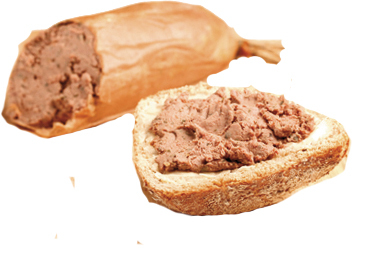 The best known variety is a spread made according to a traditional Brunswick recipe (“Streichmettwurst nach Braunschweiger Art”). These products contain more fat than their firmer counterparts for slicing, which makes them spreadable. These sausage that kept their German original name, are made with coarsely minced pork meat and bacon. They can be sliced or spread, depending on their origin. 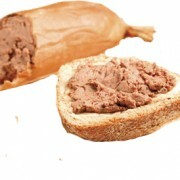 Poultry liver sausage is low in fat and high in protein and a great spread on whole grain breads. Finely minced beef, pork and bacon, seasoned with spices and smoked. 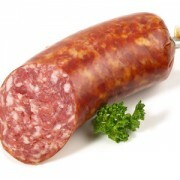 They belong to the sliceable fresh sausage type, which also include German salami, cervelat sausage, and garlic sausage. Salami and cervelat sausage are the absolute favorites in their category. A mildly seasoned salami specialty, dried and matured and smoked over beechwood.